Astronomy, Astrophotography and Telescope Blog » Narrowband SLR camera lens imaging setup with CCD camera. Narrowband SLR camera lens imaging setup with CCD camera. Narrowband imaging places different demands on the optical system compared to other types of astrophotography. With regular white light or RGB imaging, we need to make sure that the optics bring all the colours of the spectrum to focus at the same point. Inexpensive telescopes and optics are notoriously poor at focusing broadband light. We get chromatic aberrations and bloating of bright stars. This makes such equipment unsuitable for white light or RGB imaging. When using a narrowband filter, we are discarding most of the light and essentially only one wavelength is used. With these constraints removed, old camera lenses suddenly excel with narrowband filters. The second-hand market (e.g. Ebay) is saturated with a large number of high quality lenses from 35mm filter Single Lens Reflex (SLR) cameras. The older style have an M42 thread fixing and are generally unsuited to modern DSLRs - these days you purchase an expensive auto-focus lens for your DSLR! This means lenses which were of considerable quality in their day can be purchased for peanuts. For less than £30 I have lenses of 28mm, 55mm, 135mm and 200mm focal length. Coupled to an astronomical CCD camera and a narrowband filter these lenses perform remarkably well. My sensor is quite small (about 10mm across). These means that an typical SLR lens has no problem illuminating the sensor, and star shapes in the corner are entirely acceptable. With the advent of much larger sensors in astrophotography cameras, many wide field narrowband imagers have correctly moved onto medium format lenses, but with a smaller sensor, SLR lenses are fine. Two challenges meet the prospective SLR + CCD camera + narrowband filter user. First, the lens must be mounted to the camera with the narrowband filter in place. This presents the prime motivation for heading over to medium format lenses. There is very little back focus on a SLR lens. I have solved this problem by machining a small adapter. One side has a thread that matches my M42 SLR lenses, and the other side has a thread that matches my CCD camera. The thickness is arranged to put the sensor plane at the correct distance from the lens to get focus at infinity. A small internal thread holds a 1.25" Narrowband filter. There is potentially enough space to fit a filter wheel in there, but I have gone for the easy option of manual filter changing. I might change this in the future, but one thing at once! The second problem is focus. Getting accurate focus by hand is virtually impossible. My main telescope uses a geared stepper motor attached to a USB motor controller which speaks ASCOM - this then talks to FocusMax allowing fully automatic computerised focusing. Such a system is vital for good quality work. I've extended this system to work with my SLR lenses. Using a geared second stepper motor and pulley mounted on a plate, a timing belt wraps around the movable part of the SLR lens barrel. 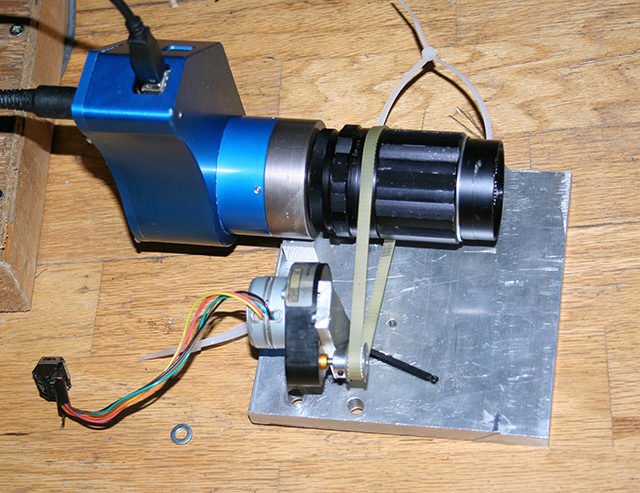 The stepper motor and pulley moves this belt, and the belt gets enough purchase on the lens barrel to adjust the focus. FocusMax then takes over and sets the focus exactly. Some lenses might be a little smooth for this approach, but it is easy to glue a couple of matchsticks to the lens barrel to give the belt some teeth to work with. Moving over the medium format lenses gives enough back focus to use in-line focusers such as the Finger Lakes PDF. With regard focus drift, I’ve found that this varies from lens to lens. My 200mm lens is terrible for this, and goes out of focus quickly as the temperature falls. However, the 135mm lens I use most of the time tends to hold focus all night – so it pays to acquire a collection of lenses and try them out to see which works best for you. The final piece of the puzzle is preventing dew. Usually a 6 to 8 inch flocked dew shield is plenty, however on some nights I use a simple resistor wrap to add a little heat to the lens. The dew shield also acts are a light shield to keep moonlight etc away from the camera. Once all these elements are in place - focuser, ccd camera, narrowband filter, SLR lens, auto-focuser - and mounted on a tracking platform (bolted to the main telescope!) and autoguided some tremendous results can be obtained. This type of lens would be useless with a large sensor or in white/RGB imaging, but the combination of the narrowband filter and the modest sensor size make a powerful combination.